Kirsch Catalog : For your use, the entire catalog is available for downloading. All the Quick Tips and other detailed specifications of the entire line is contained in the file. You will also see the product price break points for each item. Very useful information for deciding which rod to buy, or seeing the image of an accessory item you need. Note: This is a 2009 catalog as the 2010 version is not available at this time. 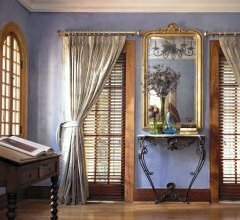 Measureing for the right fit can help you avoid problems during a drapery or curtain installation. This measuring guide will help you get the right size drapery the first time. It is a jpg image that explains several different window types and the things you need to consider before buying the curtain or drapery, or have it custom made. Things like stack and overlap are explained using diagrams for clarity. Traverse rods or curtain rods can be fixed in size or adjustable. The adjustable type give you more room when ordering this piece of the treatment. All you need is the approximate measurement of where each end of the rod should be, and order a size the will cover the area. Ceiling and wall brackets are covered in the PDF link. It shows the the method of attachment provided on the bracket pieces and suggest proper anchors and screws for different wall construction. It guides you with easy to understand images that makes installation a snap. This method covers the concealed screw make up of the wall mount to the through method of the ceiling mount offered in the Kirsch Wood Trends Collection. New, low prices on all Somfy AC and DC motors. This includes the Glystro curtain rod motors. Switches, controls, tubes and all the other components can be purchased at the same time. Note: Most interiors product motors and parts are ready for shipment. You can motorize roller shades, roman shades, blinds and draperies with these products. You can even connect some of the motors to your home automation system. Corner curtain rods and bay window curtain rods are similar in construction and installation. Both use what I call the "goal post" corner mounting brackets that allow for the rods to be joined in the corner. The corner angle can vary as the method is designed to accept different angles. Corner and bay curtain rods can be single or double. The double curtain rods include brackets designed to hold two curtain rods. See the factory installation PDF at the above link. It includes images showing the installation process and of the parts included to do the installation. View this PDF file for all the answers on assembling a great traverse rods. All the part numbers are listed, instructions of how the system goes together is shown with images. Really takes the mystery out of what is inside the traverse rod. Also useful on just about any traverse rod as the mechanics are mostly the same. Making a valance look pleated uniformly and keep that look is easy with the valance pleater. This item attaches to your fabric to fold in the pleats and keep them. It attaches to your curtain rod bracket, and is easy to install. If your time is short, or your talent in making draperies is lacking as mine is, then this is a quick solution that yields great results. This cord tension pulley is made to hold up under tough commercial use. The pulley is made out of polyvinyl, and the rest is made out of heavy gauge metal. Use it for holding drapery cords down, or other innovative applications such as continuous loop cords on shades. Comes in 7 inch and 10 inch models, one zinc plated finish and the other painted white. Several styles of all vinyl models are also available. Combination Curtain Rod Rod combination can allow you to do many creative treatments on your windows. This Dauphine/standard rod can be used to place your curtains behind a valance that requires the wide pocket. Other combinations are available for traverse rods and curtain rods. There is even a triple combination in the standard curtain rod. Combination rods make it easy to do layered treatments that look profession on your window. Pictured is a wide pocket valance rod over a traverse rod. Fringe and Trim from one of the oldest and largest producers in the US. Hundreds of colors and patterns for your selection. Trims for pillows, draperies, upholstery and even shades and valances. Also, Conso has workroom items such as large cords of thread and even supplies to make your own ballon and roman shades. 156 inch cafe curtain rods are available for the extra wide or long windows. This curtain rod can be used with loop-tab curtains, eyelet curtains or with rings and clips. 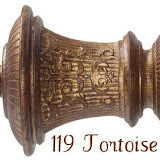 Includes all hardware including finials. The 1 1/2 inch diameter metal rod can hod the weight when installed properly. Use on sliding glass doors or wide spans of windows in any room in your home. Arch curtain rods are made of different materials and price points. 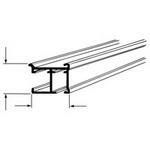 This instruction sheet will cover the basic vinyl curtain rod for windows up to 92 inches. First, when determining the size needed, measure the arch portion of the window you are covering. The sizes listed are flat rod lengths, so this is important in getting the correct size. 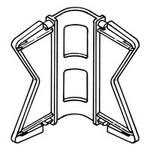 The brackets included are either for an inside mount or a outside mount. The inside mount consist of several U shaped brackets that are mounted to the contour of the arch. Cut the curtain rod with a hacksaw to the needed length. Insert the rod into the pocket at the top of your curtain and then snap the rod into the brackets you have installed. If your size is beyond the maximum, you can buy more than one rod and a splice that is designed to connect the two. The vinyl is soft enough to "bend" to the contour of the arch. Corner windows can use a hand drawn system with draperies or curtains with this bent section designed for the corner. It works with the 9600 Kirsch Architrac which is available up to 20 feet in one piece. This means you can cover over 40 feet of space on two walls. More space can be covered by using the splice designed to connect two rod sections together without interfering with the carrier operation. Wall and ceiling mounting brackets are available, and all the other components needed to build your own custom curtain rod. You can design it yourself, or call for assistance. 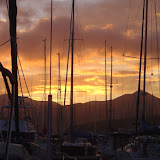 We have experts available to be sure you have all the right components, and to offer advise on putting it all together. Curtain rods come in different widths and have different projections. Some have lockseam construction which means they form a rectangular tube with the seam in the back of the rod sealed. This type gives you a stronger curtain rod that will support more weight. Less expensive types are available that work fine on smaller curtains. These form a C shape with the back side open. Both of these are for standard shaped windows that require a standard curtain treatment. Save money, replace worn out cords on traverse rods instead of buying new one. 40 feet of cord included in this kit. Measure the width of your rod, add it to the height from the top of the curtain rod to the floor and double it to determine how many feet you need. Broken carriers can be replaced at the same time. 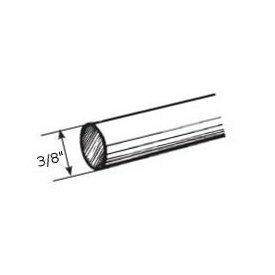 Curtain Rod Splice: If your window is wider than the curtain rod you picked for your draperies, more than likely there is a splice made to join two or more rods together. Many of the curtain rods from Kirsch and Graber have these splices available. Another use for extra long curtain rods, over UPS size limits, is to have the rod cut for shipment. This saves truck shipping which can cost as much or more than the rod. Another kind of splice can convert two regular curtain rods into a corner or bay window curtain rod. These are adjustable from 90 to 180 degree to fit any angle. New Kirsch items for 2010.
to your curtain for an easy installation. Made for small and large cafe rods, just slip on the rod, spring the clip apart and attach it to the top hem of your curtain. Other models available that have a clip attached to the bottom of the wood or metal ring for larger diameter rods. Extreme Cafe RodsLooking for a cafe rods with a little beef? This line of cafe rods is designed for the wide, long windows that will be covered with heavier curtains and draperies. It includes brackets and finials and it has matching traverse rods available in the Graber Decorative traverse rod line. A swag holder clip is available if you are using for a swag valance treatment. 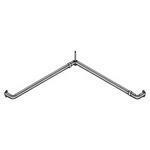 Standard rings are available for curtain or drapery attachment. Double Tassel Tiebacks for your curtain and draperies offer many colors, sizes and styles. This is a way to make your drapery installation truly custom. Turn an ordinary look into an extraordinary statement. These are easy to install and stay concealed behind your curtains while not in use. Can match other Conso trims used for trimming draperies, pillows or other objects in the room. Trims also available in full bolt or cut yardage. 5 Pounds per Foot capacity is what Graber rates this heavy duty made to measure traverse rod. A two-way draw can be made up to 42 feet and carry up to 210 pounds. A one-way draw can be made up to 28 feet and carry 140 pounds. This system is for pinch pleat draperies. It can be curved if needed. One mean, heavy duty system made for the tough jobs where durability is expected. We also have the standard duty rods that satisfy most installations. Extra Wide Curtain Rods are available in many different configurations to hold draperies up to 96 pounds. Single rod lengths to 20 feet can be designed to cover 40 feet of wall and window area. You can buy the parts or order made to size and specifications. Ripplefold and pinch pleat options are available. The track is made of aluminum and finished in white. These are the same track systems used in hospitals and other commercial applications. They are designed to hold up in heavily used applications and perform equally well in residential applications. Heavy duty ball-bearing pulleys and carriers are used to ensure smooth operation with minimum effort.